With a generous grant from the Santa Clara County Historical Grant Program, this serene pond and surrounding areas were restored and replanted in 2013. 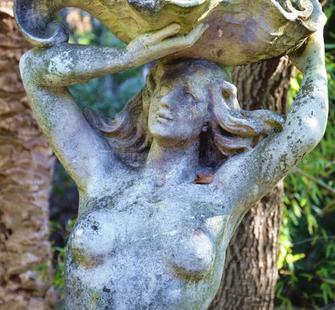 The pond itself features a provocative cast-stone mermaid rising out of the water. Befitting the grotto-like setting, plentiful plantings were installed to give a feeling of lushness and create a sense of intimacy. Queensland Poplar (Homalanthus populneus), Long Leafed Yellowwood (Podocarpus henkelii), and Angel's Trumpet (Brugmansia 'Charles Grimaldi') are just a few examples.